Metal is one of the oldest roofing material options in the world. Many historical buildings have green copper roofs while many residential and commercial buildings have metal roofs that are durable and resistant to the elements. Today, there are many different types of metal shingles, shakes, and tiles available. Commercial property owners often prefer metal roofing materials because of their unique qualities and low maintenance requirements. Below, we will be discussing the advantages and installation of metal roofing in-depth. Keep reading to find out if metal roofing is a viable option for you. Metal roofing is typically associated with industrial or commercial structures. 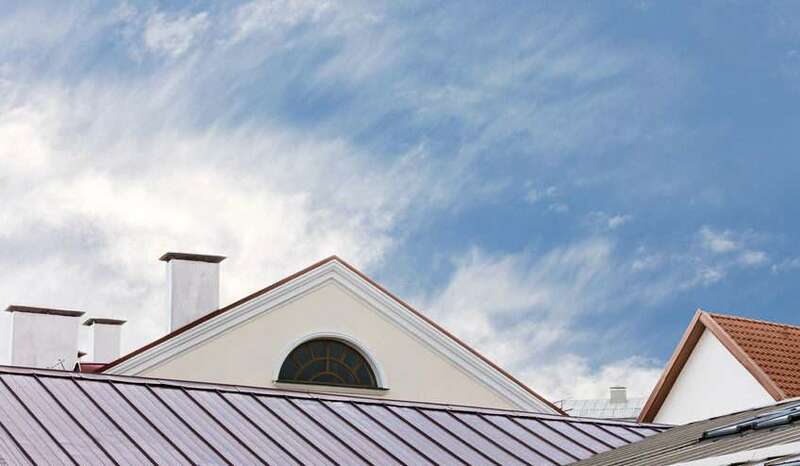 Metal roofing is also a popular option for residential property owners, as it is one of the most cost-effective roofing materials over the long run. Since metal roofing primarily consists of metal coils or sheets, it can be cut into many different shapes and sizes. Tin, which is an older roofing type that is not commonly used anymore. Each metal roofing type has its advantages and disadvantages but, generally speaking, all metal roof types have most of the same advantages. One of the most prominent advantages of metal roofing is that it is much more durable than conventional roofing materials. A run-of-the-mill metal roof can protect your home for up to sixty years. Since they have a longer lifespan than most other roofing material options, these roofs are also more affordable over the long run. A modern metal roof features a hardened factory finish that makes it less susceptible to damage of any kind. Metal roofs are also less vulnerable to harsh weather conditions than conventional roofing options like clay tiles. When you decide to install metal roofing, you still have a few options regarding types, colors, textures, and designs. Speak with your roofing contractor to find the most suitable metal roofing for your house and its surroundings. Contrary to popular belief, metal roofs are not noisier than other roofing types during rain or hail storms. They are installed with insulating sheathing that blocks out loud noises. You won’t even notice the rain. When it comes to lightning, metal roofing is a better option than other materials, such as thatched roofs, as it is not flammable or combustible. A steel roof that has reached the end of its functional lifespan is 100% recyclable. If you don’t want your roof to end up in a landfill or if environmental friendliness is one of your crucial buying considerations, a metal roof may be the answer. Metal roofs can reflect the sun’s heat to a large extent in the summer and acts as an insulator that circulates the heat beneath the roof back into the interior in the winter. This has the effect that your home is cool during hot summer months and warm in the winter. The benefit of a metal roof temperature controlling capabilities is that it keeps your heating and cooling costs low. Due to the popularity of metal roofs, the chances are that if you want to sell your home, potential sellers will be more likely to view the metal roof as a benefit. It is a durable choice and does not pose the same problems as shingles or other materials. Since metal roofs are usually lighter than some other roofing materials, such as concrete roof tiles, you will not have to install reinforcement structures to accommodate the added weight. This will save costs and reduce the size and duration of your roof installation. Metal roofs are typically straightforward and quick to install. Apart from being one of the more affordable roofing materials, you will also save money when it comes to installation. Moreover, your roofing contractor will get the job done quicker than if you were to use conventional roof tiles. Although metal roofing is one of the most durable roofing material types, damage from high winds and leaks can occur if the roof is not correctly installed. The importance of carrying out proper installation cannot be overstated. You will lose out on many benefits that metal roofing has to offer if you go with an inexperienced installer. M&J Roofing and Exteriors offers high-quality metal roofing installation services in Indianapolis to ensure maximum durability and protection for your home. Our roofing team has all the necessary experience, skills, and equipment. We can install all types and styles of metal roofing. Together with our installation services, we will also help you decide on a metal roofing type that is suitable for your needs, home structure, and budget. When you contact us, we will provide you with sufficient information to allow you to make informed decisions regarding your new roof. After installation, M&J Roofing and Exteriors can also offer you routine maintenance services to ensure that your new metal roof remains in the best possible condition. If you own a property in Indianapolis and want to gain the advantages of a metal roof, M&J Roofing and Exteriors can help. We have extensive experience in supplying and installing metal roofing. We offer comprehensive metal roofing installation, repair, and maintenance solutions. Our services are geared towards meeting our clients’ specific needs, and we go the extra mile to ensure that we provide you with as much value as possible. Contact M&J Roofing and Exteriors today for a free written estimate and metal roofing quote.